Two astronauts in the very distant future awake from a protracted "hyper sleep" to find themselves in a powerless spacecraft with memory loss as to exactly why they're floating in a tin can. One of the men, Bower (Ben Foster), goes on the hunt for the ship's reactor and finds a few terrified survivors, but also discovers a marauding clan of bloodthirsty gearhead creatures. The other man, Payton (Dennis Quaid), remains at the one operational terminal to assist Bower despite progressively questioning his own sanity. Nah, you don't really have to "fear what happens next." I wonder what the real studio/investor pitch was for Pandorum. Travis Milloy's screenplay and what ended up on the screen isn't a remake, but more a true "re-imagining" of a gaggle of well-worn ideas seen on prior space horror outings. Using the re-imagining excuse is probably sugarcoating what might be a more insidious method of reselling genre fans the same bill of goods over again in a hackneyed and confused package. All I'm saying is that programmers like this that go theatrical make you wonder if studios are trying to pawn off aging concepts as fresh to clueless mainstream movie goers who haven't seen their many points of reference. Of course, very rarely do genuine horror gamechangers appear, but the wanton theft seen in Pandorum is more insulting than even the most misguided straight forward remake. The pallid, scrap metal-wearin' beasties are a mix of those seen in John Carpenter's Ghosts of Mars and Neil Marshall's The Descent. The film describes "pandorum" as a dangerous God complex that can develop over extended time in deep space, but you'll immediately think of the devilish Sam Neill in Paul Anderson's Event Horizon. Throw on poorly realized allusions of Carpenter's The Thing, Marshall's Doomsday, Scott's iconic Alien, and McTiernan's Predator. Drench all that with a bland aftertaste and there's Pandorum in a nutshell. There's also echoes of my gripes with Anderson's Resident Evil with this appropriately grimy yet pretty-looking Christian Alvart-directed mishmash simply having no sense of gravity or importance given the incredibly vital hook of the ship essentially being the cradle of life for mankind itself. The not-terribly-bloody fight sequences also share Resident Evil's millisecond assemblages of limbs lurching about with little sense of what's actually happening. Even though overuse of slow motion can be annoying, it's certainly more agreeable than filmmakers treating hand-to-hand choreography as a formality to slop together in post. As I've said, there's not much thrust to Pandorum, much like the giant motionless spacecraft at the center of the story. The creatures have no rhythm or reason with an unsatisfyingly vague origin. Since the vicious DOOM-rejects like to adorn themselves with metal, Milloy should have made a piece key to Bower's mission of power reactivation embedded on the body of the leader of the opposing race. There's instant reasoning for the creatures to exist other than merely being a device for chair jumpers. Also, Milloy's screenplay suffers from a lack of any message despite there being ample opportunities. Bower keeps holding out for hope of finding his wife only to ultimately fail. This could have tied into a message of [axelrose]nuthin' lasts forrrrevurrr...[/axelrose], yet nope; more explosions and Dennis Quaid speaking tersely for you. I kinda like the flick. Clearly it was Event Horizon meets The Descent, but I still enjoyed it. A friend and I saw this on opening night expecting the second coming of Alien (the trailers did a good job of actually making you think that this movie is going to be awesome). In the end, we were sorely disappointed. My friend spent the movie in disbelief over the impossibilites of the movie's spaceship. I spent the movie figuring out how many elements were lifted from Resident Evil. 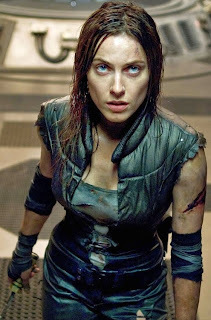 Hell, the main girl is a ripoff of every Milla Jovovich action role ever. Next thing I need to do: hire Overture's marketing people to make my boring life seem exciting. Maybe they could trick people the same way that they tricked me into thinking that Pandorum would be good. Actually, Pandorum is lifted from works such as Metamorphosis Alpha, The Star Lost, Doctor Who's The Ark In Space, Orphans Of The Sky, Space 1999 to 2099: MISSION OF THE DARIAN, The Wreck of the BSM Pandora, and Ben Croshaw's 1213. With Greco-Roman and christian myths as overtones and metaphors. Alien is lifted from Planet Of The Vampires, It! The Terror From Space, Fiend Without A Face, and The Ark Space. The Descent is lifted from The Time Machine, The Lurking Fear, The Beast In The Cave, The Rat In The Walls. I don't they I need to get into doomsday. But it did have a message, and the message was to never give up hope. As humanity had hope for a new life on Tanis and Bower nearly gave up on that after finding out what happened to his wife. That's why the title of the film is derived for Pandora's box which contained hope. The creatures were desendants of passengers that went mad with Pandorum and were manipulated by the main Gillian to be cannibals.